For our second hike in Telluride we drove the Black Bear Pass Rd to the power station at 10,300ft, adjacent to Bridal Veil Falls east of town. This was as far as one could drive (high clearance, 4WD recommended) as the road beyond is one-way leading down from the pass to Telluride. We planned to hike to Ajax Peak which has a convenient trail to its summit, something Eric had wanted to do for a few years. I was game since it was a new summit and harbored hope I might be able to combine it with Ingram Peak, across Ingram Basin from Ajax. After parking the car we first checked out the power plant from a distance since there's no legal access to for the casual hiker. Listed in the National Register of Historical Places, it was one of the first operating AC power plants in the nation and currently produces about 25% of Telluride's electrical needs. The unique building is perched on a cliff at the top of the falls in a spectacular setting (marred only by the lime-green heavy metal holding ponds down below, the same type that was recently breached by the EPA in an area not far from here). The hike to Ajax is not particularly tough, but a good workout, climbing about 2,500ft in a little less than three miles. 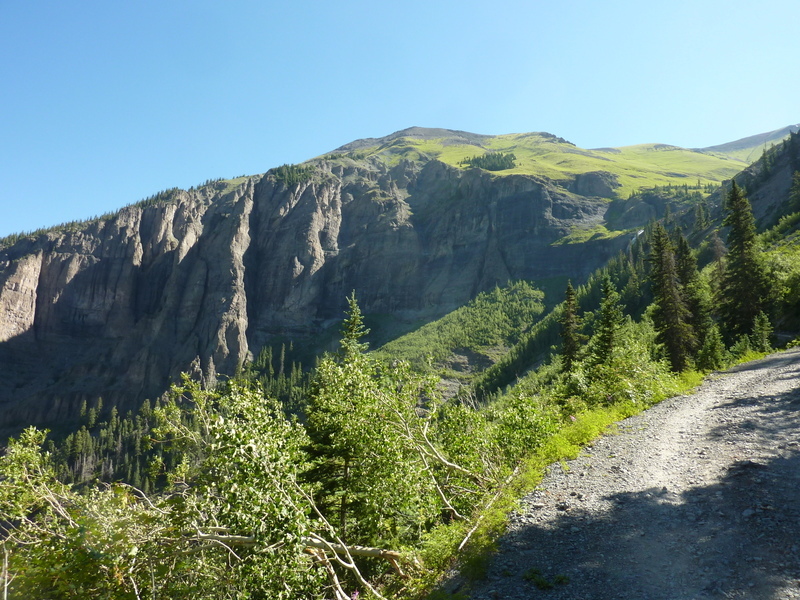 The first half of the hike follows the Black Bear Pass Rd as it switchbacks up the steep slope overlooking Telluride and the San Juan River drainage to the west. It passes by some mine ruins that include an old, rusting stamp mill which we checked out until the three engineers were satisfied they understood the operating principles of the old machinery. After crossing Ingram Creek, the road leads up into Ingram Basin where one finds the unsigned start of the trail leading to Ajax. The trail is a series of long switchbacks rising up a vibrant green alpine slope with abundant flowers accenting the scene. It's an understandably popular trail as we shared it with a number of other parties that day. We arrived at the summit shortly after noon, taking about two hours at a fairly leisurely pace. The summit offers a fine view of Telluride to the west, Ingram Basin to the south, and Savage Basin to the north with the 4x4 Tomboy Rd leading through it to Imogene Pass. We spent about half an hour lounging about the summit to some dismay on Leroy's part - he would have preferred we kept moving, not unlike myself most times. The others had no interest in Ingram, it turns out, to no great surprise. I would have to leave it for another time. We returned via the same route, getting ourselves back to Telluride before 2:30p. It seemed too early to call it a day, but Steve and Eric were more interested in investigating the hot tub back at the hotel than more hiking. So I was set out solo to tag a few summits around the Telluride ski area. The first of these was rather trivial, Coonskin Mtn. The gondola's St. Sophia Station lies nearly atop the mountain, only a few hundred yards from the highpoint further north. I had neglected to tag this the day prior when we rode the gondola to the See Forever Trail and it was just as well. I don't think the others would have appreciated this one too much. The Ridge Trail runs north of the gondola station, just past Coonskin's highpoint which is found in a clump of trees with no views whatsoever. Not too far down the northeast side is an overlook complete with a nice bench and a short Telluride history lesson on a nearby sign. Unfortunately the aspens have grown thick since the overlook was installed and without maintenance the view has greatly diminished. One can still get nice views of the town below from other parts of the trail, however. Back at the gondola, I rode it down the other side of Coonskin Mtn into the Mountain Village where it is clear that the real money resides. This huge development sprawls over an area three times the size of Telluride, with luxurious condos, hotels and huge private residences, all with ski-in/ski-out access. My goal was Bald Mtn in the southwest corner of the ski area, about three miles south of the gondola station. It's not a particularly scenic hike, up trails through denuded ski runs, past a frisbee golf course, all these condos and homes, and eventually into the forest where some semblence of solitude can be found. I used a portion of the Prospect Trail, though it wasn't clear where exactly this rambling route starts, ends, or even where it goes. It has a number of poorly marked junctions and uses larges sections of the maintenance roads. The Forest Service appears to have been involved in its construction but it looks to have low priority to other ski resort needs. It wasn't until I was within about 15min of the summit that I actually got a glimpse of Bald Mtn. As the name implies there are no trees to block views but it's not exactly a bare pile of talus either. Green alpine grasses and plants dominate the rounded summit and it makes for a rather pleasant place to take in the nice views to be had from 11,800ft. As part of the ski area, but with no lift to its summit, it is left to the powder junkie to hike the short distance to the top to access one of several expert runs.